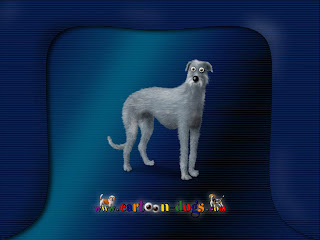 Fancy a FREE wee desktop computer cartoon picture, just to let the world know your favourite hound breed when they sit at your computer monitor? As you know, Rogue here can’t be bribed into advertising kennels, selling products or promoting events. But as we are directly involved in this one, we . . . errr, just had to mention it. Several dates have been fixed for Scottish Deerhound lure coursing events in Perthshire. These will all take place on Sundays and the fun will begin at 10am. Proposed dates are as follows: 21st September 2008, 12th October 2008, 2nd November 2008 and 30th November 2008. And to watch the trial run - click on the video below - yes, that’s the Rogue star leading the pack in the video clip, well, until I decided to loose interest on the home straight . . . I’m saving myself for the book keepers . . .
Hi we’re back from a wet, wet, wet Scottish break. For the last couple of weeks we have leisurely splish splashed in the flooded Scottish countryside as the rain forgot to stop falling. Thanks to all who have posted comment here, via e-mail or at Rogues video hosting. Unfortunately we missed the SKC August show but do have some video footage from a test run coursing trial from deep in darkest Perthshire near Rumbling Bridge. Our friends, Sue and Kevin intend to make this an open and fun event for Deerhounds and other Sighthounds over the coming months (and hopefully years) if it proves popular. And what better a place to suit the Scottish Deerhound than the hills and glens in this area - see the image. More details will be posted soon - if you are interested follow the link to contact Sue here. And if you want to send a note via surface - why not use one of these . . .